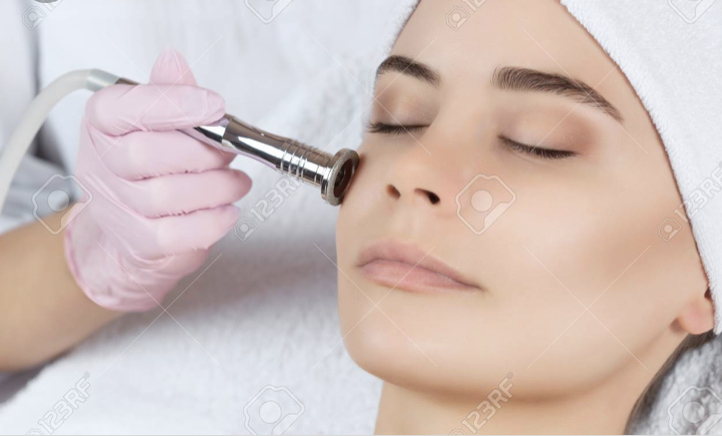 Microdermabrasion is a rejuvenating skin treatment to reduce fine lines, superficial blemishes and generally improve the skins appearance, texture by exfoliating and resurfacing safely by expertly trained and qualified therapists. How it works depends largely on the system you will use. As the beauty industry booms the development of new equipment each year means that systems change and become more and more advanced. There are two different versions you will hear about and read about. The crystal microdermabrasion and the diamond version. On this course you will learn the Diamond Microdermabrasion. This is a more new concept. It is a crystal free option and instead of the sand blasting approach it uses a “wand” that has a diamond tip. This wand is passed over the skin and exfoliates like the crystal version a bit like using a hard grit file. The exfoliated particles off the face are then vacuumed up through the same wand. This version is a bit cleaner than the crystal version, no gritty bits of residue left on the face, no fine grains to accidently get into the eyes, up the nose or mouth. Using a diamond tip means you can abrade areas near the eyes with less risk as there isn’t crystals firing out of the wand. Full practical demonstration and guidance throughout the day, learn the theory and practical application of microdermabrasion within a full facial routine. This is a professional days training and a model will be required for the day or you will be required too have a treatment. Course manual and confirmation will be emailed to you on payment of deposit. This course are accredited and insurable with ABT insurance. A £50 deposit is required on booking. The reminder can be paid on the day of training.